Why did you transfer to NIU? I started at College of Lake County, where I earned my associates degree in Engineering Science. The “2+2” engineering program made the transition extremely easy! Transferring to NIU was a wonderful process, it seems like just yesterday I was going through orientation and now I am about to graduate! Other students should choose NIU for its amazing educational programs. I also have a few words of wisdom for future transfer students. This first one may be more applicable to Engineering majors; don’t overload yourself with classes! Four engineering classes and one Gen Ed is a lot, especially during your first semester. Take a course load you can manage, get your feet on the ground, and get involved with a student organization. You’ll learn so much from hands on experiences in my opinion. I am currently studying, and about to graduate with a degree in mechanical engineering. I chose this major because of my passion for designing and problem solving. After a few engineering internships, I knew that engineering was the right choice for me! Where’s your favorite spot on campus and why? My favorite spot on campus is probably in the NIU machine shop or the Aero lab in the engineering building. I spent a lot of time in those two places throughout my time at NIU and I learned so many practical skills that I never would have otherwise like welding and machining best practices on a mill or lathe. The idea that most excites me about engineering is that it gives me the opportunity to impact the world in a positive way. In addition to my mechanical engineering degree, I completed my emphasis in sustainable energy. I am truly excited start my career in the Aerospace industry and help make decisions to safeguard our environment and to keep travelers safe. The most interesting thing I have learned so far is that in the engineering world, anything is possible. I believe that given enough time and resources, a group of dedicated engineers could accomplish just about any task that was set in front of them. What most surprised me about NIU was how easy it was to get involved. 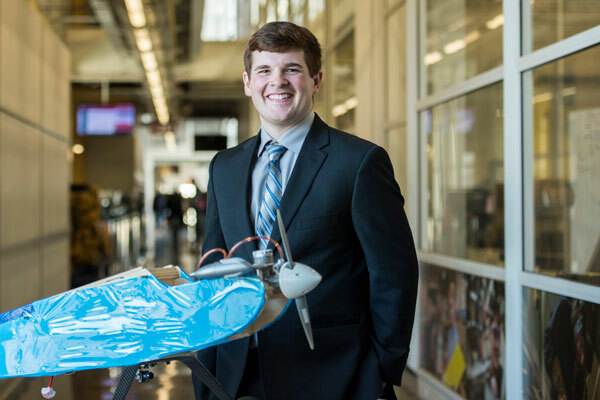 Throughout my time at NIU I was part of the robotics team, the Society of Automotive and Aerospace Engineers (SAE) and was awarded funds to take part in a student-generated research project through the Undergraduate Special Opportunities in Artistry and Research Program (USOAR). Which Northern Pact principle do you relate to the most? I believe that I relate to the “purposeful” principle the most. I have always been my own advocate to reach educational goals and been a firm believer that there is much to be learned and even more to be experienced. What does the Northern Pact mean to you? To me, the Northern Pact was an advocate for my success at NIU. The generous support I received was a true blessing to help me finish my education, and for that I am forever grateful.